The SdKfz 250 was a light armoured halftrack, very similar in appearance to the larger Hanomag-designedSdkfz 251, and built by the DEMAG firm, for use by Germany in World War II. The 250 had 4 road wheels and a cargo capacity of one ton. Compared to U.S. halftracks, the SdKfz 250 series was less mobile, with unpowered front wheels. However, its tracks made it far more mobile than the armoured cars it replaced, and it was a popular vehicle. Most variants were open-topped and had a single access door in the rear. Adopted in 1939 to supplement the standard halftrack, it was based on the 1938 Sd.Kfz. 10 prime mover and intended to carry an infantry section in company with an armoured car. Production delays meant the first 250 did not appear until mid 1941. As with all German military vehicles, it was developed into a bewildering number of subtypes. 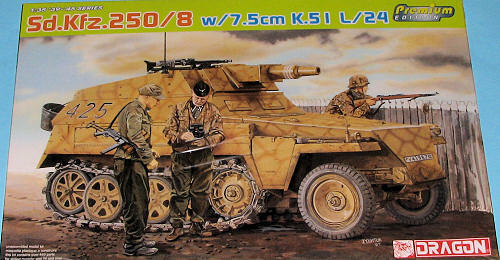 The subject of this kit, the SdKfz 250/8 leichte Schützenpanzerwagen (7.5cm) , was a support variant armed with a 7.5cm KwK 37 L/24 gun and an MG 34 machine gun. 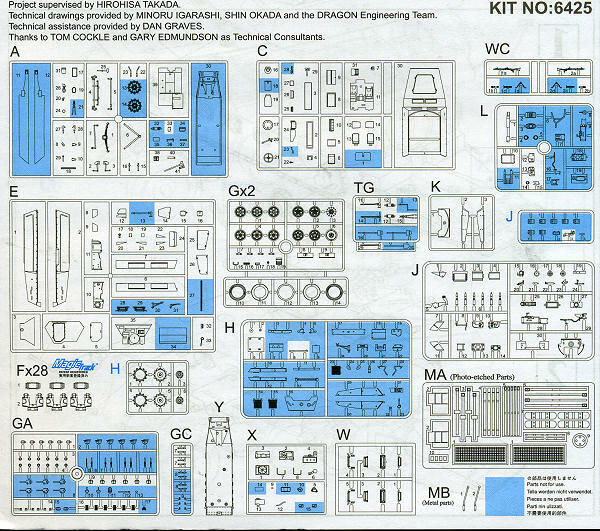 Dragon's instructions are very nicely illustrated and provide both Gunze and Model Master paint references. Markings for four vehicles are provided on the two small decal sheets. One is from 5.Pz Div "Wiking" in 1945, another from an unidentified Eastern Front unit, another from Pz.Gren.Rgt.302, 2 Pz Div in Germany in 1945 and another unidentified unit from the same time. All are in panzer yellow with red brown camouflage. As you can see, you certainly get your money's worth from a Dragon kit. The superlative level of detail and the sheer parts count (440 in this one) will not only give you a lot of bang for your buck, but hours of modeling pleasure that will result is a highly accurate model when done. My thanks to www.dragonmodelsusa.com for their support. Get yours today at your local shop or on-line store.